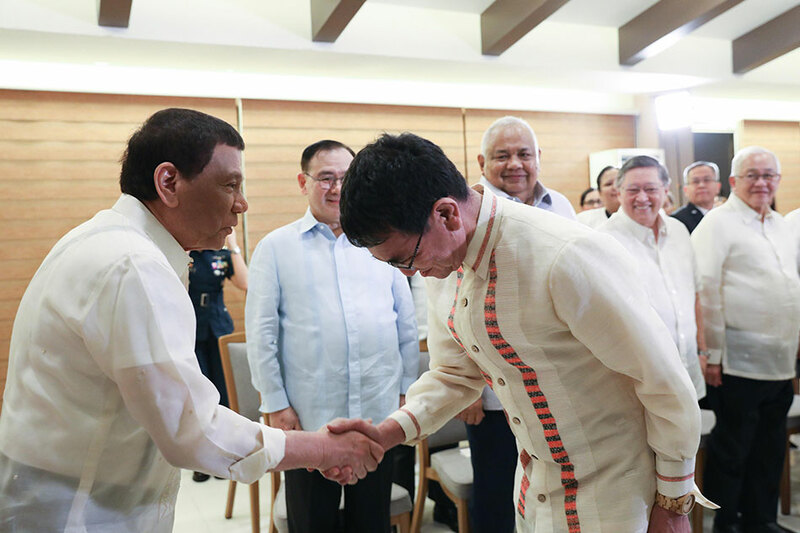 MANILA -- Japan's top diplomat paid a courtesy call to President Rodrigo Duterte in his hometown in Davao City on Sunday, months after Tokyo's rival, Beijing, sent its chief envoy to the southern metropolis. Duterte was "honored" by Japanese Foreign Minister Taro Kono's visit, which is a "testament to the strengthened strategic partnership between the Philippines and Japan, and an affirmation of our long-standing bilateral friendship", Malacañang said in a statement. The barong-clad Kono, according to the Palace, said Japan welcomes the ratification of the Bangsamoro Organic Law that expands the autonomous Muslim region in Mindanao, where Tokyo has given billion-yen grants. The Japanese envoy also expressed sympathy to the victims of a double bomb attack at a cathedral in the southern province of Sulu, where at least 22 were killed and some 100 were wounded during a Mass, said Malacañang. Kono's 3-day visit was prompted by the invitation of Foreign Affairs Secretary Teodoro Locsin Jr. Part of the Japanese official’s agenda is to attend the inauguration of the Japanese Consulate General in Davao, the Palace said. Locsin, Executive Secretary Salvador Medialdea, Finance Secretary Carlos Dominguez, and Philippine Ambassador to Japan Jose Laurel were present during Kono's courtesy call. In October last year, Chinese State Councilor and Foreign Minister Wang Yi also visited Davao City, promising that Beijing will help solve the energy issues of Manila, its "good friend." China and the Philippines are among claimants in the resource-rich South China Sea. Duterte, who assumed in 2016, sought to repair ties that were strained by the sea dispute, refusing to flaunt the Philippines' victory in an international arbitration court. Beijing and Tokyo also have competing claims over a group of small islands in the East China Sea.